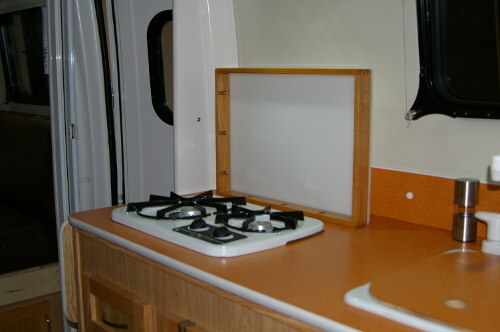 I've just completed installing a new stove-top in our Escape 19. I'm sad to report that the stove top/cutting board I built for the old 2 burner stove doesn't fit the new stove. So, I have a nice Stove Cover/Cutting Board for sale. It fits the two burner stoves in our Escapes. Asking $35. This price includes the old white two burner stove. We will be attending the Oregon Coast Gathering at Bullard's Beach later this month. I can deliver to that rally, or bring it there for you to look at. Not to hijack the thread, but can I ask what your Formica is? I'm on my phone so the picture is small - is it Orange Greek Key? Not a problem. 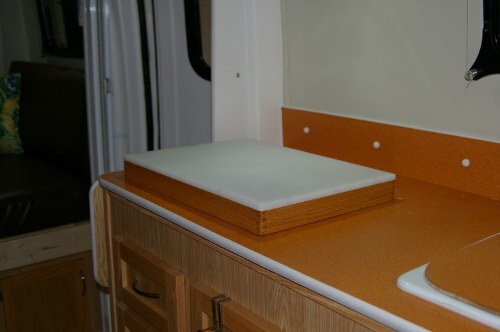 The formica is "Atomic Orange". I thought it was no longer produced but I found a couple of places that seem to offer it. Maybe not available through Escape? It's pretty bright and not easy to decorate around. But it does give a "custom" look. How much are you asking for the cover only? And would you be able to ship it to ETI? We are picking up our trailer the second half of July but don't have time to travel to Oregon as we have to be back home in time for fieldwork. But sure would love to buy/get your cutting board.